From the makers of the ThinkPad comes an exciting Android 3.1 Tablet that offers a superior multimedia and entertainment experience. The Lenovo ThinkPad Tablet. Unlike the other Tablets, it comes with additional features to help business professionals to do more on the go and also allows IT managers support them easily, no matter where they go. This means, better management of multiple devices, more customization options, higher productivity, and more importantly, enhanced security. 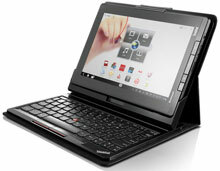 So, if you are looking for a Tablet built for business, then it has to be the ThinkPad Tablet.